We have not passed this way before—not even close. Life feels very unfamiliar, and as Joshua instructed the children of Israel, my little family and I are trying with all our might to stay “2000 cubits behind the ark,” as we lean hard on God for guidance. We don’t want to rush out ahead of Him, nor do we want to lag too far behind Him. Doing either would mean getting outside the parameters of what it means to stay in the center of His will. He always knows when we need extra assurance and confirmation that He is with us, doesn’t He? We had to be away from home for an extended period of time, and on the night before we were to leave to come home, I called our home voicemail to get our messages. There was a message from our neighbor asking us to call her. I tried, and when I got her voicemail, I left a message for her. I didn’t hear back, and we left to come home the following morning. On our way, it hit me that I didn’t hear back from her, so I texted her asking if everything was okay. She texted back saying she needed to talk to me, and I instantly knew something was wrong. You might know that our cell phone has been having issues, not allowing us to make or receive calls, so I texted her back explaining about the phone and asking her if she could text us instead of talking. She texted back and told me that she was out of state at the time, but another of our neighbors had called her to tell her that the 3rd-floor french doors that lead from Zach’s bedroom to his balcony were standing wide open! Keep in mind that there are no screens on the doors! I asked her how long they had been open, and she said for two weeks! The other neighbor hadn’t known for sure that we were out of town, and she didn’t know how to reach us. After such a long time, she called and mentioned it to the neighbor who had contacted us. Instantly, we began to wonder how the doors came open, and of course, the first thought was concern that someone may have broken in. But, how? They would have had to use a very tall ladder, and it just wasn’t likely that this had happened. Then it hit us. Not long after we left home, Hurricane Florence had passed through our area! We figured Zach’s doors must not have been securely latched, and the hurricane winds had blown them open. Imagine the scenario. We were a few hundred miles away from home, in the car, traveling, and this is the news we received. You can just picture the thoughts going through our minds. Strong winds, possibly heavy rain, wide open doors for two weeks, etc. What had blown out of or into Zach’s room? Did excessive rain come in through the open doors and damage the flooring? If the wind was strong enough to open the doors, had it caused harm to any of Zach’s things? Had birds, insects, or animals made their way in? Not only Zach’s room was exposed but his doors being open had made the whole house vulnerable! Right there, in the car, the three of us prayed, and we spoke faith into our situation. We chose to believe that GOD had taken care of everything, in spite of the potential for our home being violated. I am not going to say it was an easy ride home. Worry tried to overwhelm time after time as we kept putting it back in God’s hands and realizing there was not one thing we could do BUT trust Him and His protection. We finally made it home safe, by God’s grace, and as we pulled into our parking area, Kevin told me that he and Zach would go in first to assess what was inside. Bless his dear, kind, thoughtful heart, he wanted to spare me from seeing it first. As I stood downstairs anxiously staring up at Zach’s wide-open doors, I recalled the morning we left, and how, like every other time we get in the car to go anywhere, I had prayed this prayer, “Lord, please protect us, bring the three of us safely home together, protect everything here while we are gone, and let everything be just as we left it when we return.” Leaving home, we had placed everything we had in God’s hands, trusting Him to watch over it while we were gone. The relief that flooded over me was enormous. But, even more than my relief was utter astonishment at what Kevin was telling me. My mind replayed the whole thing once more—of all times, a hurricane had come through (of course we did not get anywhere near the brunt of the storm, but nevertheless, there had to be some awful strong wind to blow those doors open), who knows how much rain had fallen, etc. I tell you what, as soon as I could come inside, the three of us prayed together, this time a prayer of wholehearted thanksgiving and praise to the God who loves us with an everlasting love, who hears us when we pray, and who faithfully answers those prayers! Oh, how we praised Him and continue to praise Him! There is just no explanation why things were “just as we left them when we returned” other than our dear, loving, faithful God answering the prayer we prayed that morning in the car. God’s providential care should never be underestimated. It is there when we don’t even realize how desperately we are in need of it. Oh, the lessons He has taught and is steadily teaching us through this! At the beginning of this post, I mentioned how unfamiliar and uncertain everything feels to us right now. If God can shield our home from invaders of any kind, from hurricane rain and wind damage, and from all harm when we didn’t even know we needed the extra protection, can He not take care of our future? We don’t understand the logic of all that has happened and is happening in our lives, but God is all-wise. We don’t need to understand His logic. We simply need to trust His wisdom. We simply need to believe with all our hearts that He never takes His eyes off us and all that affects our lives. I know He absolutely allowed those doors to come open and for us to find out they were open for two weeks without us knowing about it just to prove that we do not even need to know what is going on for things to be okay. The only one who needs to see the whole picture is Him. He is in control. We do not have to be. He takes care of us and what pertains to us even when don’t realize we need taken care of. Romans 8:28 does not say that everything that happens in the life of a Christian will be good. It says that all things will work together for good—both the good things and the bad things will work, hand-in-hand, for good. God’s ways are far higher than our ways. I do not know what you may be going through but God does, and none of it surprises Him. He absolutely has you in the palm of His hand, and you are going to be okay. It may look like the enemy has the upper hand, but there is no hand higher or more mighty than our God’s. He is in control of every little and big detail of your life. He is watching out for you when you don’t even know you need to be. If it touches your heart, it touches His. You are the apple of His eye, and He loves you with an unconditional, unchanging agape love that will never end. He leads you gently, and He often spares you the worst details. He will let you know what you need to know when you need to know it. You don’t have to be suspicious of Him because He has no ulterior motives. He always, always has your best interests at heart. 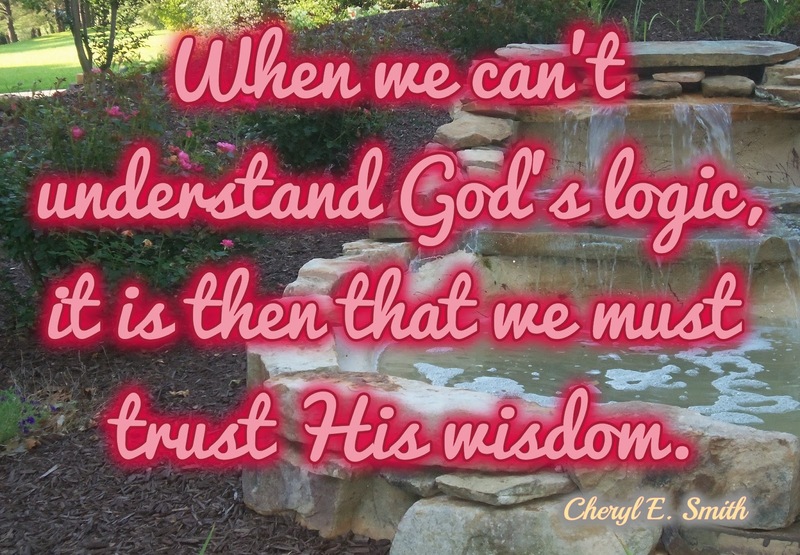 When you can’t understand His logic, trust His wisdom.